King’s is fortunate to have some first-class sporting facilities and coaching which we are happy to share with our neighbouring schools and the wider community. The school hosts local events such as netball tournaments and swimming galas. Since 2015 Minilympics and, more recently, Rugbylympics, are very popular days with primary schools in and around Canterbury. 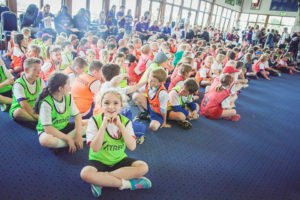 King’s collaborates with Canterbury Christ Church University (CCCU) each year to deliver a day of exciting sporting activities for local primary schools. 180 Year 4 pupils come to Birley’s playing fields and, in teams of mixed schools, are given sessions on cricket (in association with Kent cricket), field testing (led by CCCU’s SportsLab department) and team athletics, as well as a talk on healthy eating and an opportunity to meet Olympic sports stars. King’s pupils and staff volunteer, together with CCCU Outreach Ambassadors. Each child attending receives a medal and T shirt and trophies are awarded for team spirit. A delicious barbecue lunch is provided and the day is kindly sponsored by local businesses. One parent who attended with his son’s school said “an exciting and engaging day was had by every child. The commitment and organisation were second to none”.